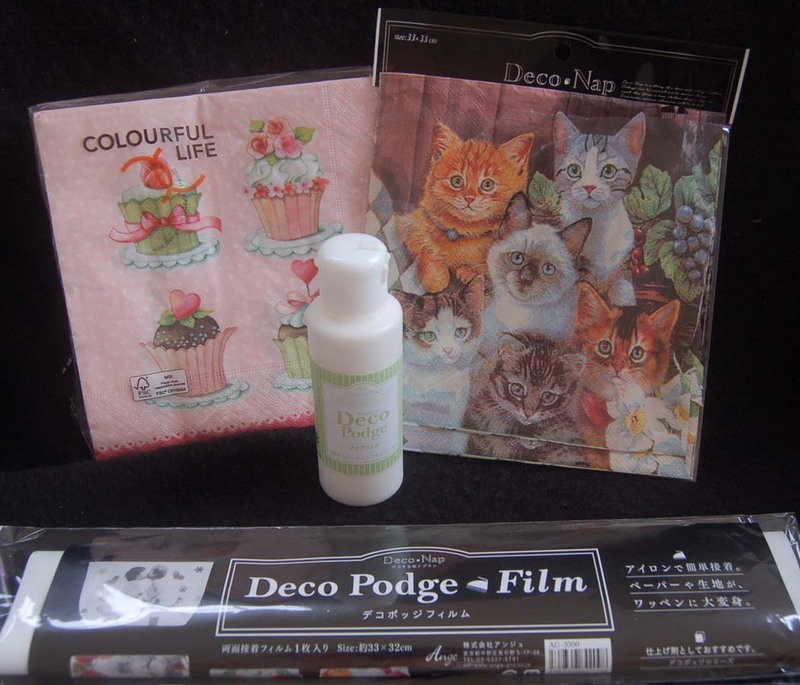 Deco Podge Napkin Projects...something new from Japan! I hope you were able to attend the Mapunapuna BFC store demonstrations of the fabulous new Japanese projects. I tried the Deco Podge napkin products and these were the results. This eyeglass holder (or mini pouch) has a zipper on the top. I used the iron-on Deco Podge film to adhere the napkin pieces to the holder. It was pretty easy and foolproof. To insure that I wouldn't melt any of the film on my iron, I covered the designs with parchment paper before ironing. I made this tote with the Deco Podge liquid. (The green label is for fabric, but I think BFC only sells the pink label which is the all-purpose one.) 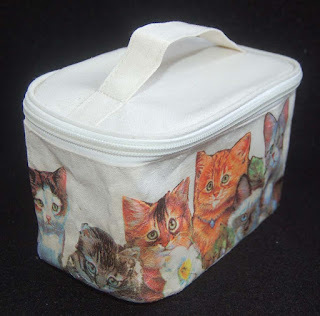 The liquid is messier than the iron-on film but allows you to apply napkin designs to surfaces that can't be ironed flat. I suppose I could have inserted a small pillow into the tote if I wanted to use iron-on method. Just think of all the fabulous items you could decorate with these products. Go to the HM Ben Franklin Crafts (in Mapunapuna) to see all the new Japanese crafts. In future posts I will be showing some of the cool resin jewelry I am currently working on. Hope to see you soon! 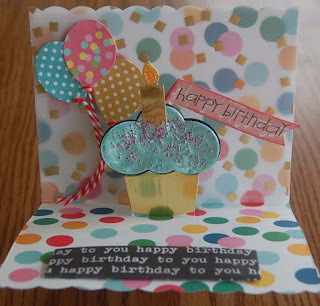 I love sending birthday cards with a 'little something' included, especially if I am only sending a card. This card was inspired by a tiny card that I purchased at a Japanese Culture Center event. The card had two pockets and a tag sticking out of one of them. Hope you like my altered version of the card. I loved the sentiment that came with the Art Impression stamp set so I picked a card from the Pebbles Birthday Wishes Card Making Pad that had sprinkles all over it. 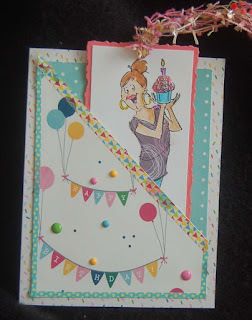 I made a diagonal pocket with a Pebbles 12x12 double-sided birthday card stock (centering the birthday banners) and reversed a leftover piece of the card stock (dotted side) for the background so that the bookmark would stand out. The pink card stock for the bookmarks was cut using a Sizzix die (sorry forgot to include it in the photo). My coloring was a bit shaky because of some recent eye treatments so I paper pieced the outfit with paper from a Perfect Prints pad ( just the right thickness for paper piecing....a bargain from BFC). The cupcake was frosted with Bo Bunny pink pearlescent paint and sprinkled with no hole beads. Some Japanese specialty yarn (lots of fabulous yarn at BFC) was tied through the punched out hole on the top of the bookmark. Oh, I almost forgot to mention that I lined the edge of the pocket with washi tape (skinny ones, probably from Celebrations). 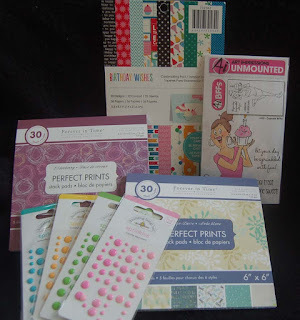 The front of the card pocket seemed a little bare so I added some Doodlebug enamel dots....I have lots of them now because I bought a bunch of packs from HM Ben Franklin Crafts...look in the clearance section for a great deal! Okay, that's it for this project....gotta get the card in the mail so that my longtime friend (from first grade!) will know that I thought of her and remembered her special day. 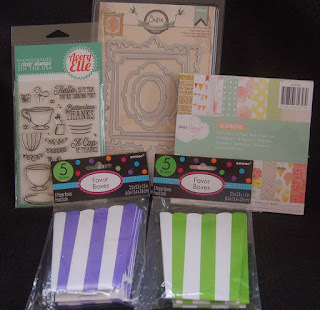 I happened to be in the party aisle of HM Ben Franklin Crafts when I spied some striped favor boxes (amscan). They reminded me of popcorn boxes and I immediately knew I had to do something with them. 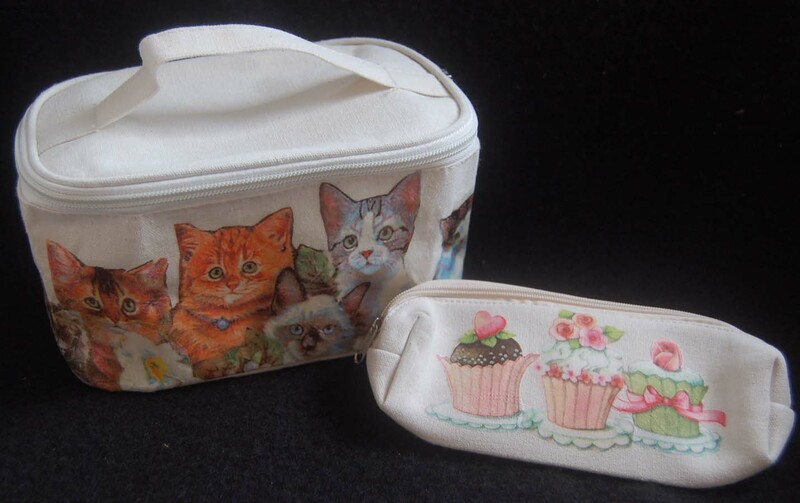 On the same day I purchased an Avery Elle teacup stamp set. As a collector of Victorian and vintage items, I felt compelled to pair the vintage teacup images with the striped pattern which seems very Victorian in style. I die cut a frame from a rose patterned sheet (Dear Lizzy Neapolitan, American Crafts) and stamped the words on it. 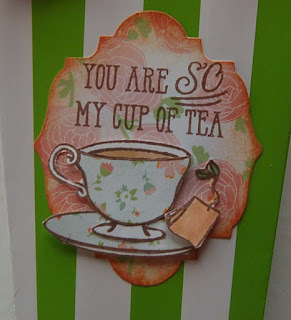 The teacup was stamped twice, once on patterned paper (from same paper pad) and once on white card stock. 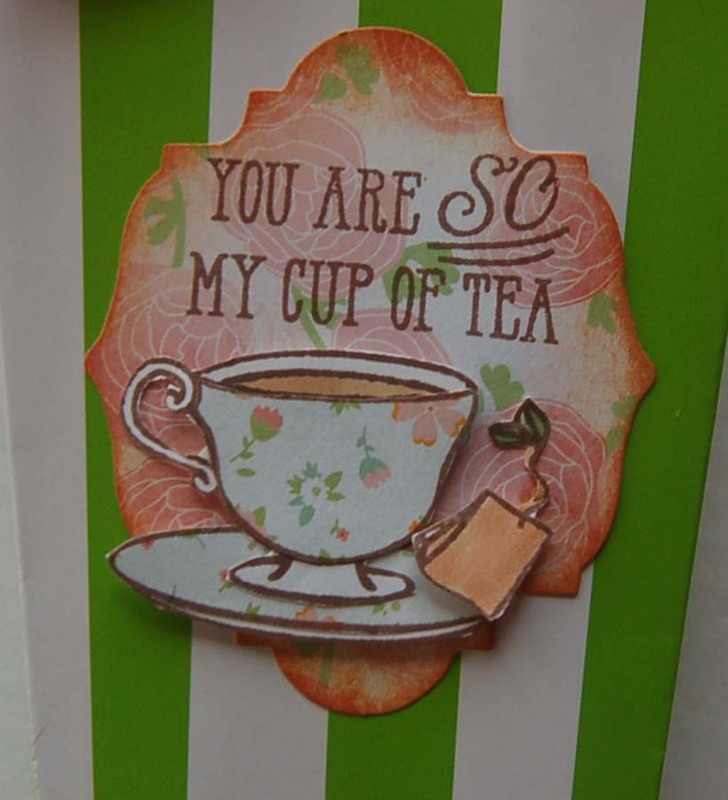 They were both fussy cut and the printed one was cut to overlay onto the white one instead of coloring the teacup. The teacups and tea bags were adhered with foam dots. 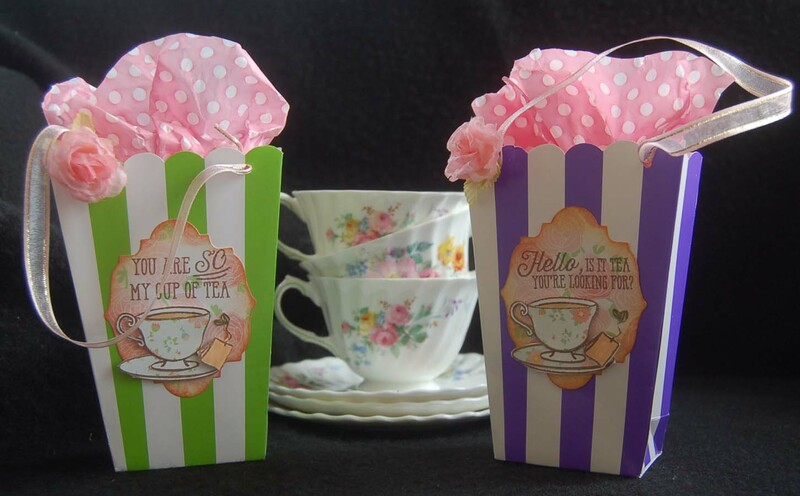 As a finishing touch and to turn the box into a bag, holes were punched and ribbon strung through to form handles. These box/bags would be great for tea party favors filled with fancy tea bags and a tea strainer or maybe a vintage spoon. I plan to put these in my stash for hostess gifts....always an appreciated gesture. 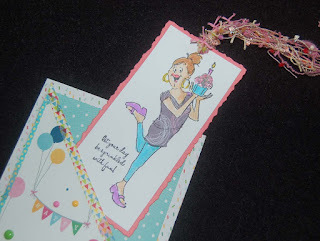 Happy, thoughtful crafting! 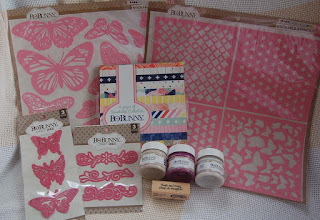 I wanted to play some more with the new Bo Bunny products I purchased from HM Ben Franklin Crafts. 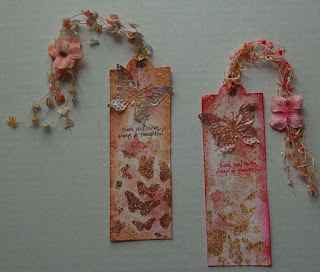 Since I use more tags than cards, I decided to add to my tag stash with these bookmarks. 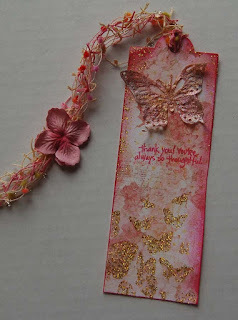 I cut the top half of the bookmarks with one of the tag dies from the Little B set (from BFC). To make the tag longer I rolled the paper through the die cutting machine until just before the bottom cut. Then, I used a paper trimmer to cut the rest of the bookmark. I cut two of these bookmarks per bookmark, one from a Bo Bunny printed 6x6 sheet and one for the back from a solid colored paper glued on to add strength to the bookmark. 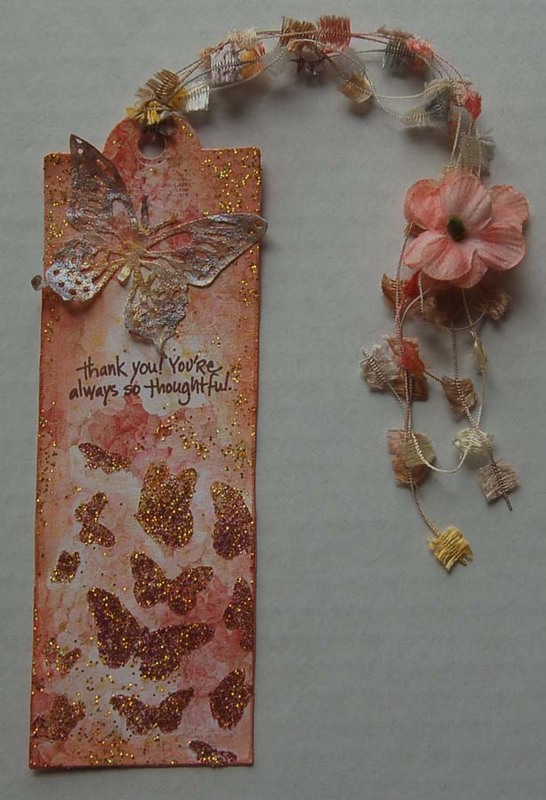 To finish off the bookmarks and to form a tassel, several strands of specialty yarn were looped onto each bookmark. A knot was tied near the end and flowers glued on the knots so the tag can be slipped over the gift bow. Distress Ink or Momento pink ink were rubbed on the edges of the bookmarks. I was so happy to find matching colored hydrangea flowers in my stash to glue onto the yarn of one of the tags (because the Bo Bunny card stock I used was a hydrangea print.....hard to see under all that glitter...hahaha!). 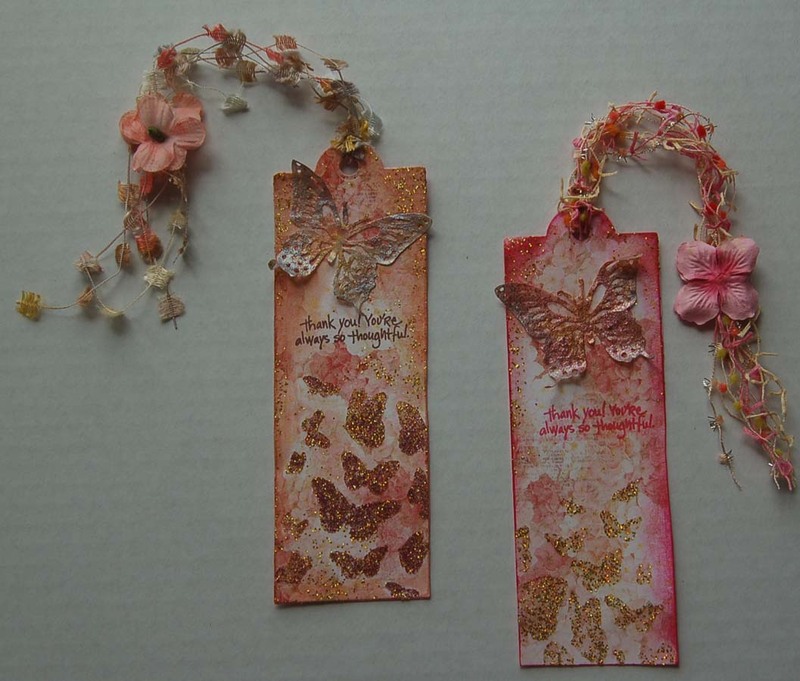 Although I did not use the large butterfly stencils or floral boarder dies on these tags, I put them in this photo to show you some of the many new Bo Bunny products. 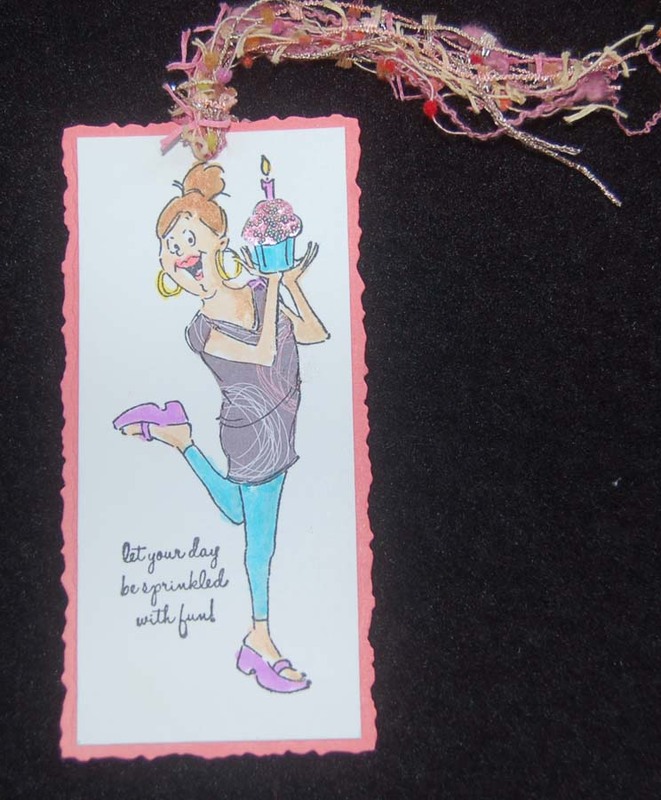 I hope you've enjoyed learning about how I made these bookmark tags which serve double duty as gift labels and book place holders. With Kindle do people read books any more? Maybe these should be craft magazine markers. LOL! 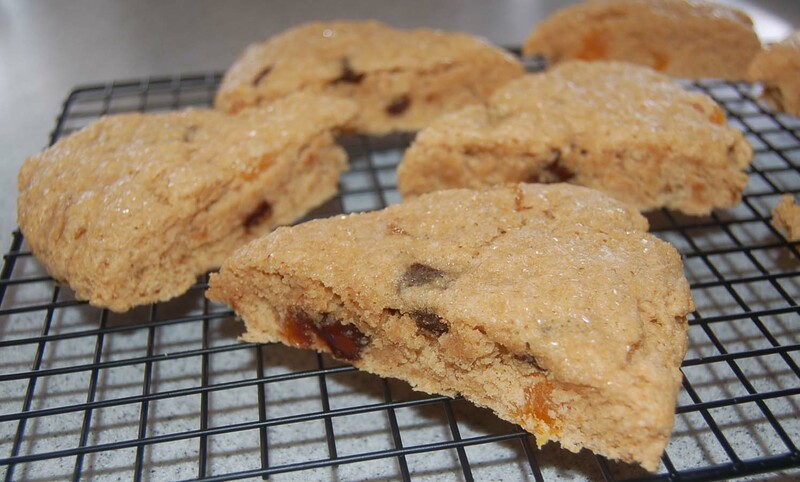 Chocolate Apricot Scones and a Craft Club Winner, Leanne! I made these whole wheat Splenda Blend Chocolate Apricot scones again this week to use up the extra buttermilk I had. They were delicious and normally I would print out the recipe, but I think that I already posted it awhile ago. If you missed it and want the recipe, leave a comment and I'll reprint it. Succulents are very popular these days, probably because all of us are so busy we don't even have the time to water our house plants. 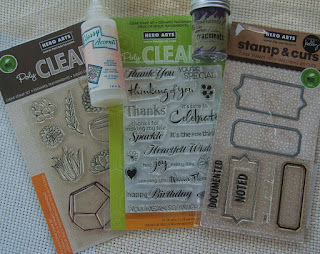 I thought that the Hero Arts stamp set (that I purchased at HM Ben Franklin Crafts) was very attractive and I especially liked the 'glass' terrarium. 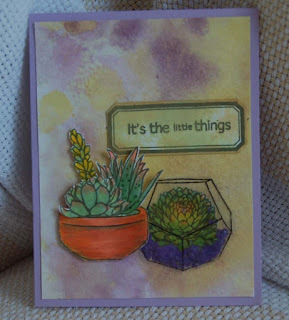 I started with a Distress Ink water colored background then stamped the succulents and clay pot on marker paper (available at BFC). After coloring them with Copic pens I cut them out by hand. The terrarium was stamped with Staz-On black ink on acetate and trimmed with a sharp scissors. After arranging the pieces on the card front, I first glued down the terrarium plant and using the Glossy Accents I adhered the Stampendous purple fragments and the terrarium. The Glossy Accents by Ranger is supposed to be used as a coating to achieve a shiny topping, but it makes a good clear glue, too. Fragments comes in lots of colors and is usually added to embossing powders or other texture mediums, but I think that it looks great as planting material. I discovered the fragments (in lots of colors) in the BFC clearance bin along with the Hero Arts sentiment clear stamp set. 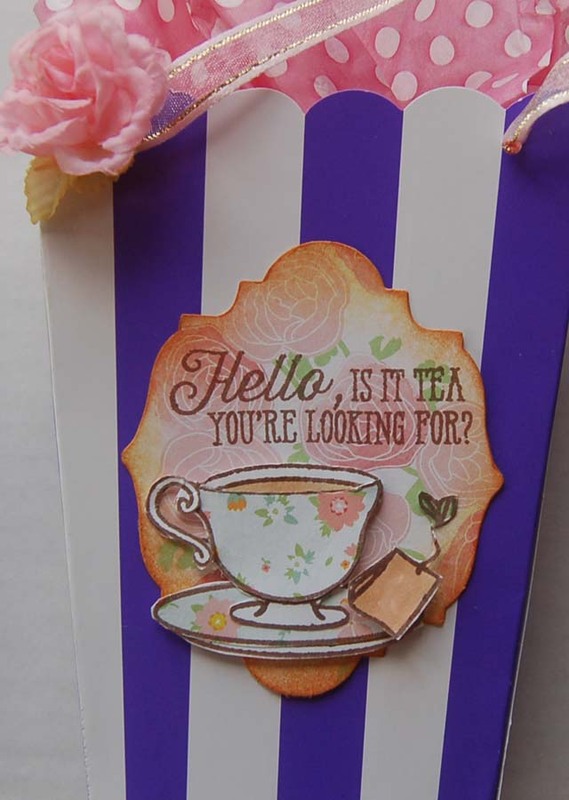 The label for this card was designed to cover up a stamped sentiment that turned out to be too bold. 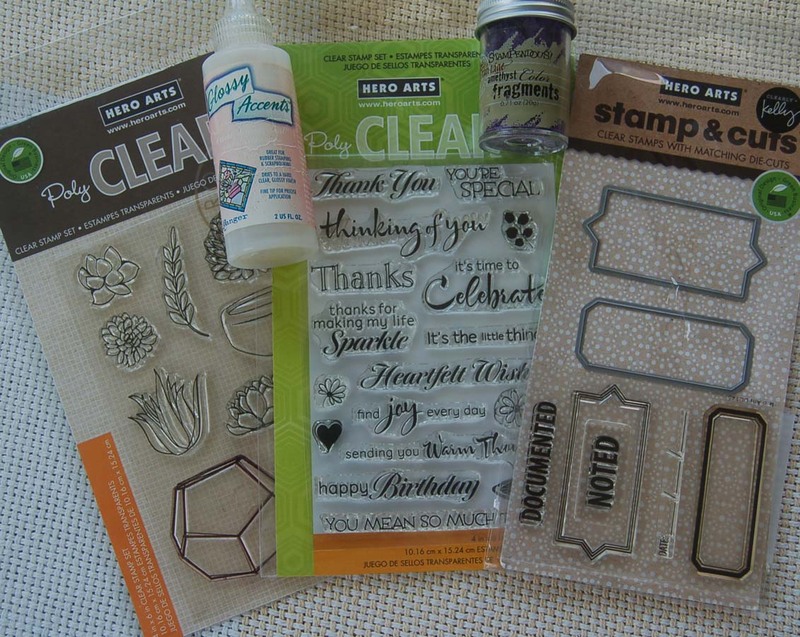 I think the Hero Arts stamp and cut set has some wonderful dies and stamps that can be used on many projects for that 'office' look. The recipient of this card is a 'geeky science guy' who has an affinity for succulents. Isn't this card just succulent and juicy enough for him to put next to his laptop? 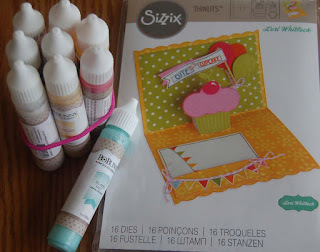 First off, I have to say, "I love, love, love this new Sizzix Pop-up Cupcake Card die set!" 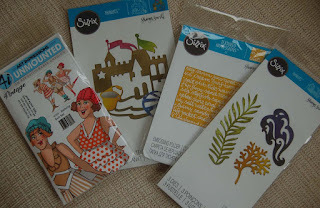 which I purchased from HM Ben Franklin Crafts. 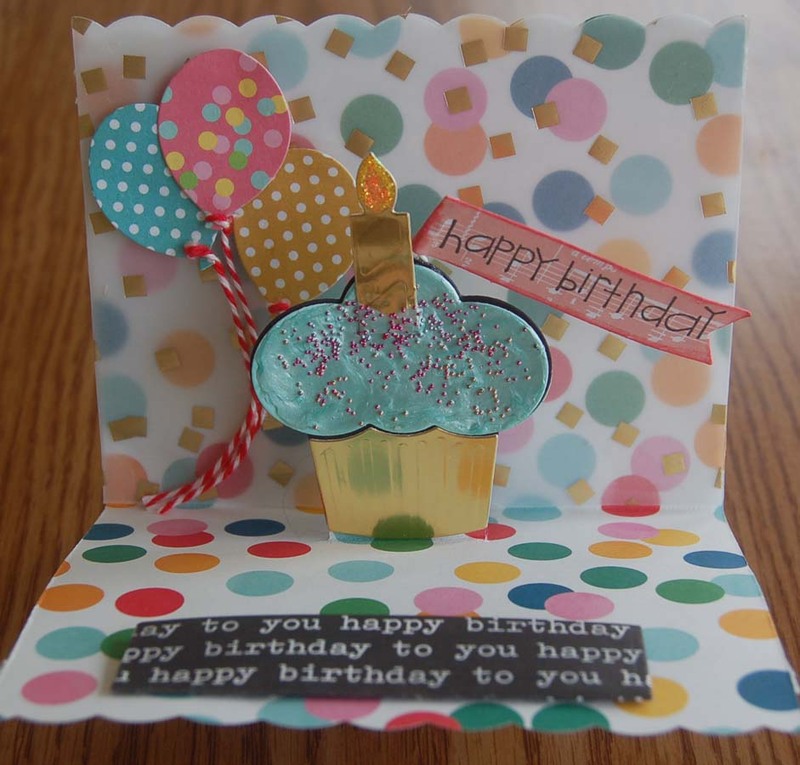 This set not only has a great pop-up card base die with a scalloped edge, it also contains 15 other dies including a cupcake, candle, banner, balloon, cherry, castle, magic wand, crown and a gift card pocket. 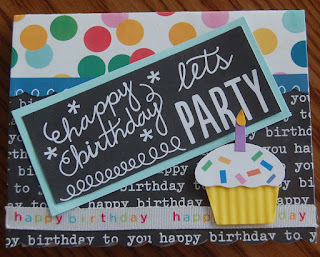 You can do so much with this die set, not only birthday cards. 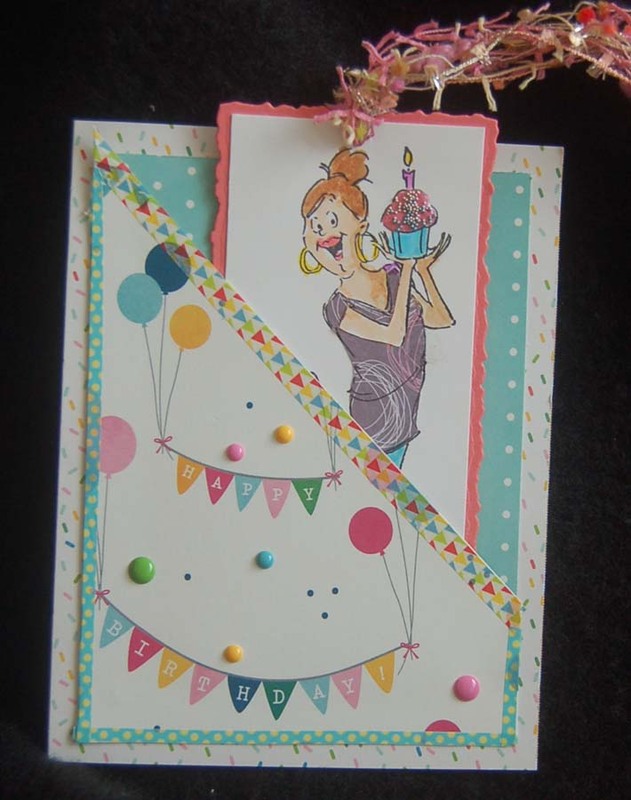 At first I was planning to keep the card front simple and not so colorful, but accidentally put it together with the double sided Pebbles birthday card stock upside down so I took it apart and of course some of the foam dots and tape left marks so I had to camouflage the damage with a cupcake sticker and ribbon...LOL! The pop-up part of the card was covered on the outside with a panel of the polka dot side of the Pebbles card stock. Also from Pebbles is the chalkboard sign that was cut from one of their 12x12 sheets. 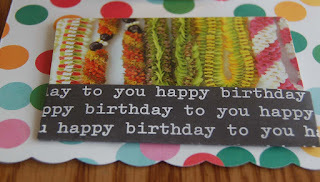 Here is the pop-up inside of the card that I had planned to be a burst of color when compared to the outside. I love that the cupcake foil cup and candle are impressed by the die as you cut them out...sorry the photo does not show this very well. I tamed down the color of the dot design card stock, by die cutting a piece of American Crafts vellum (with gold squares) and taping it to the card with vellum tape. To make the cupcake more realistic I applied Bo Bunny pearlescent paint (new at BFC!) 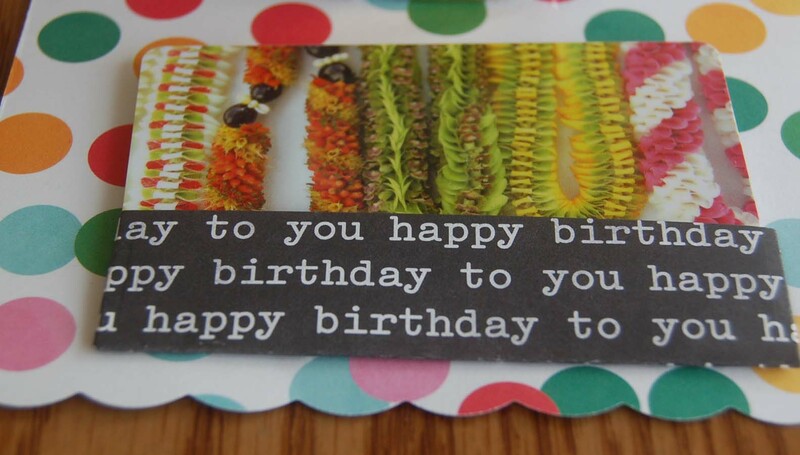 to the frosting die cut piece and sprinkled on some tiny no-hole beads. Twine was added to the balloons and Stickles applied onto the candle flame. 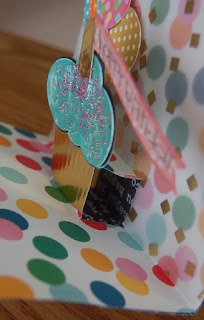 This close-up photo shows how the die cuts the card so that the cupcake can be popped up. You see (in the folded out step) the underside of the double-sided print card stock panel that was placed over the top of the card on the outside. The gift card pocket was die cut, folded and adhered to the card. It snugly holds the Ben Franklin Crafts gift card. This makes the card the 'perfect' gift! Besides the fabulous Sizzix die set, this photo shows some of the Bo Bunny pearlescet paint colors. I love the luscious colors and the fact that the nozzle make them easy to apply tiny dots for embellishing. Please note my neater-desk tip: Rubber band the tubes together so they will stand up and all the colors stay visible and in one place. Okay, that's it for today.....thanks for visiting....Happy Crafting Blogland! I have been entertaining house guests for a few days and decided I NEEDED to craft to relax. 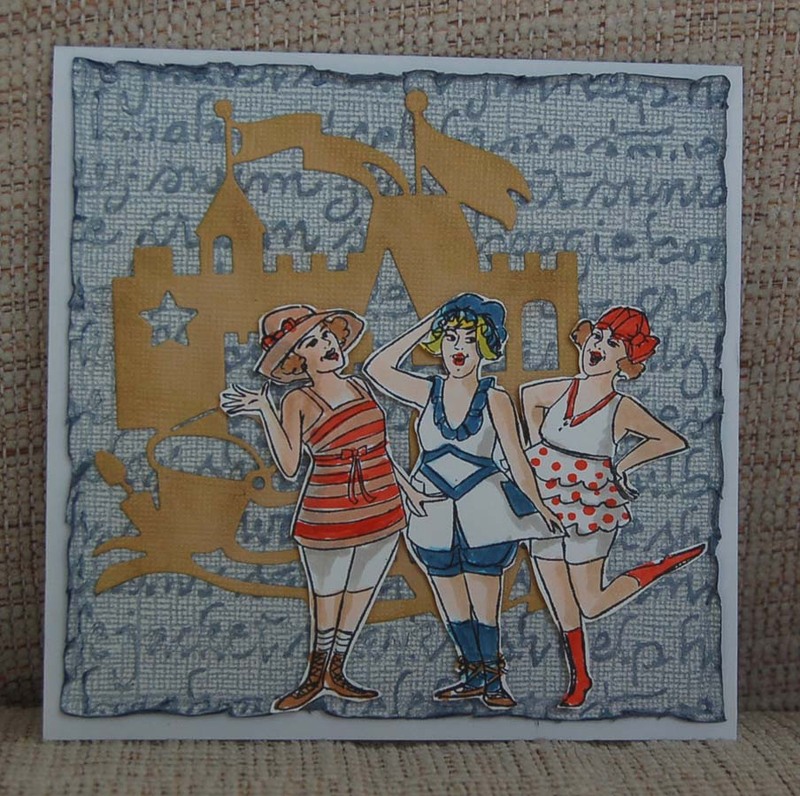 I chose to do a quickie seaside scene card inspired by the Art Impression stamp set, Sizzix embossing folder (from BFC) and Sizzix sandcastle die set (also from BFC). 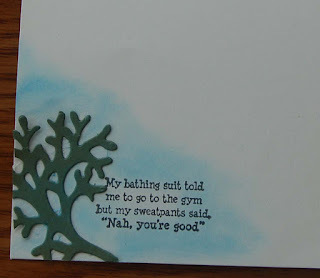 The seaside words were embossed on a white washed craft core paper and sanded to bring out the words. A little water on the edges and some rubbing helped to distress the edges. The die cut sandcastle was tinted with a little chalk and Distress ink. 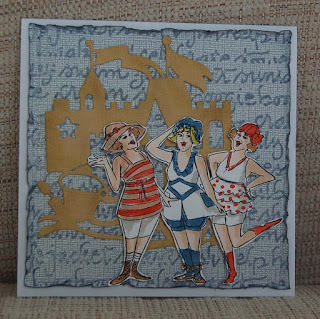 I colored the three lovely vintage ladies with Copic pens, fussy cut them, and adhered them to a (5-1/4" white square) card with foam dots. 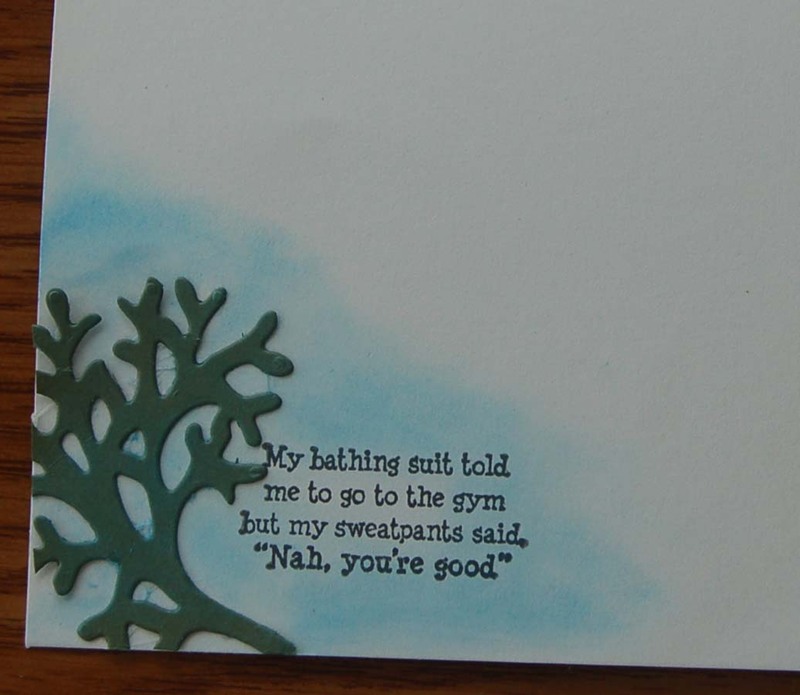 I think the saying that comes with the Ai stamp set is humorous so I couldn't resist stamping it inside the card, adding the die cut seaweed, and applying some chalk for additional color. This was a super easy card to assemble because of the dies and embossing folder. I think all the supplies can certainly be used on many future summertime seaside projects. Please check out HM Ben Franklin Crafts to buy the Sizzix items and see what other great products are available at the 'best craft stores' in Hawaii!